Bring a bit of the arcade along to the office with this classic and portable Desktop Skeeball game. 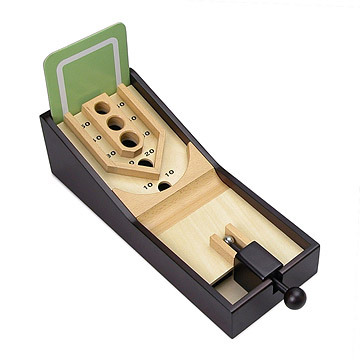 Bring a bit of the arcade along to the office with this classic and portable Desktop Skee Ball game. Whether you're rekindling an old love for a childhood pastime, or practicing for the real thing after hours, this beautifully crafted game, equipped with automatic ball return, will definitely ramp up the fun on those lunch breaks. And if anyone questions your work ethic, insist it's an elaborate paperweight. Made in China. Includes instruction manual with 6 sample score sheets, and 2 stainless steel balls. Not intended for children under 14. For 1 or more players. We love it. We didn't realize there was a bit of assembly required (minimal, just inserting two screws for stability) but we were able to start playing almost immediately after opening. This is well made but would be better if the back board was wood and not cardboard. We are going to make a better backboard for it. They will love it to sit on their bar or table top or desk at their business. Fun idea for a desk. Wasn't a fan of the cardboard backboard as it didn't match the quality and nostalgic look of the wood. My boyfriend loved it and plays often! Me and my wife love to play skee ball! Well made and sturdy for hours of fun! Bought this Skee Ball desktop game for my boyfriend who was missing playing the game. He Loved it! This game is made very well and works great. This is not something my husband or kids pick up to do while relaxing at home. He loved it and said it will defiantly add to his current stable of desk challanges.